When the idea of the schoolyard habitat was first considered, a schoolwide contest was held to choose the best name for our outdoor learning area. Since the school mascot is a wildcat, the name "Jackson Elementary Wildcat Habitat" was chosen. With lots of support from the parent teacher's organization and community sponsors, a committee was formed to plan and build the habitat. Before the habitat was built the site was an open field behind the school. 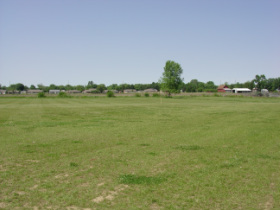 It was used as an extra ball field. The site had a ditch on the north and east sides. One cottonwood tree stood toward the back of the field, with a drainage area running right down the middle. In this photo you see an ariel view of the children on groundbreaking day surrounding the perimeter of the future habitat. 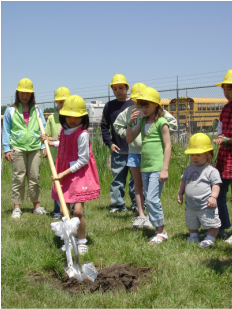 One student from each grade level was chosen to help plant the first tree. Later, each child got to plant one tree in the habitat. Over 600 native trees were planted by the students. Some of the first jobs in building the habitat were drilling a well, trenching in an electric line, and digging the pond. Many volunteers from PTO, the community, and the staff were enlisted for these more involved tasks. Children helped to arrange the rocks around the waterfall and edge. The finished pond with waterfall.